In 1897, John Calvin Ferguson, the American president of Nanyang Public School (the predecessor of Jiaotong University), constructed a street in his own name (originally Route Ferguson) to make it easier for students and staff to commute to class. In 1943, it’s name was replaced as Wukang Lu (武康路) – named after Wukang County in nearby Zhejiang Province. After the communist takeover in 1949, the Chinese name was enforced. 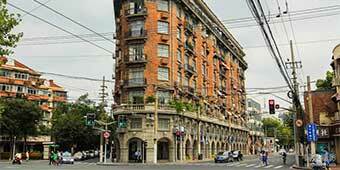 Today Wukang Lu is one of Shanghai’s most historic and attractive neighborhoods. Located in the western area of the former French Concession, it was added to the country’s list of National Historic and Cultural Streets of China. Apart from that grandeur title, the street has blossomed over the past few years to become a real trend-setter. Now you can literally pass all day on Ferguson Lane with brunch, snacks, evening drinks, and even a bit of shopping along its French styled promenades. While all of Wukang Lu used to be known as Ferguson Lane, nowadays Ferguson Lane is the cluster of shops, restaurants and cafes centered around number 378-376 Wukang Lu; you’ll spot the sign proudly announcing “Ferguson Lane” in gold letters. For the sake of diversity, we’ve included all the hot spots in and around Wukang Lu and not just the #378-376 block. If you just got a new flat, or are looking to refurbish your current one, definitely check out Showroom. Its Japanese owner has various ornaments, trinkets and other cool items for the home; think wooden/nail-less picture frames, old-school chests, ceramics and candle holders. The style covers everyone from hipsters to expat-contracted professionals – there’s something for everyone. Note: Showroom is not directly on Wukang Lu, rather on Tai’an Lu – a side street jetting off to the west from middle Wukang Lu. This is another one of Wukang Lu’s most famous shops. It’s another trendy home and lifestyle shop similar to Showroom, featuring tableware, lighting, furniture, linens, bedding, Chinese ceramics (one of their specialties) and even accessories for women. On another note, Platane is located in the historic Wukang Mansion (aka Normandie Apartments) – a famous housing complex built in the French Renaissance-style in 1924 by famous Hungarian-Slovak architect Laszlo Hudec. It’s been the home of many famous celebrities, politicians and businessmen, and is an incredible relic on the promenades of old Wukang. If you’re not going to Platane for shopping, then at least stop by to admire the architecture. FYI there is also a branch near the artist area of Tianzifang. It’s impossible to speak about Ferguson Lane without mentioning Farine. This traditional French bakery is worshipped by the city’s massive French expat population, and rightfully so. It’s one of the only places in town to get real bread and coffee; the taste is straight out of Paris. They also offer delicious sandwiches, delectable pastries and other to-die-for treats. The outdoor seating is perfect for a sunny day. To mix things up from this very françois neighborhood, Azul kicks it with Spanish tapas and Latino pizzazz. Head chef Eduardo Vargas also has some delicious slabs of Argentine beef and above average wine to wash it down. If the food, ambiance and upbeat music wasn’t enough, the best part about Azul is its outdoor terraces. There are two verandas offering stunning views of the former French Concession. Grab a cocktail, take a seat, and let time pass away – this is my favorite spot on Wukang. The Coffee Tree is another one of Wukand Lu’s great outdoor cafes. Apart from the naturalistic atmosphere, they’re praised for their fanciful organic coffee. They even offer European inspired brunch, lunch, dinner and kid’s options. Along with the coffee, and food of course, I’m a big fan of their heart-healthy smoothies. The Coffee Tree is the perfect option during a family outing when visiting the historic sites of Ferguson Lane. A creation of famous French restraunteur Franck Pecol, Grains is another family friendly listing. Adults will enjoy in their artisanal coffee and imported wines, while the kids and “big kids” alike will go straight for their homemade ice cream and desserts. It’s a relaxed environment with a quaint minimalist décor, giving it a laid-back attitude. Unfortunately, the only thing not relaxed are the prices. This joint is actually another winner from Franck Pecol. If you’re tired of vegan pasta and artisan coffee, don’t worry, Rachel’s has got your back with thick, juicy, New York-style burgers. Though it lacks in pretention (which can be a welcomed change on Ferguson Lane), it certainly doesn’t lag in quality. Everything is made from scratch – the buns are baked twice daily, meat grinded when ordered, and even homemade pickles! You don’t need my recommendation on this one, get the burger and fries and everything will be A OK. Right next store to Rachel’s is WIYF. You can’t miss it because there will be a line of at least 100 people queued up outside drooling for their European-styled ice cream… Many claim it’s the best in town. If you don’t want to wait, grab a seat at Rachel’s, as you can order WIYF’s ice cream and milk shakes right from their menu. Problem solved! Wukang Lu is centrally located in the western edges of the former French Concession, near Jiaotong University. The closet metro station is Tongji University Station (交通大学站), Lines 11 and 10. Take exit 1 and walk east for 100 m, you’ll spot the Wukang Mansions and see a sign for Wukang Lu. Bus 911 and 548 are two of the most convenient lines that connect to Wukang Lu. The closest metro station is Jiaotong University NOT Tongji... No one wants to end up in Wujiaochang by mistake!